Helpful Pointers on the Pop Art of Crafting a Quality Zombie Comic : COMICS ARE EVERYWHERE! 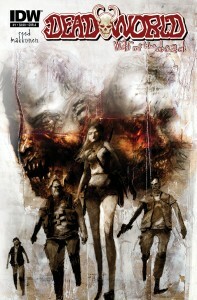 The cover of the recent comic "Dead World"
Here’s a no-brainer. Zombies are a hot commodity in pop culture! Well, a dead brainer is more like it. For a while, I’ve been developing an original idea for a comic and screenplay involving an undead protagonist (sorry, you won’t find any details here since I need to safeguard the concept) and I’ve been doing research looking at the recent wave of zombie love bombarding film, TV, literature and, of course, comics. The phenomenon’s appeal shows no signs of slowing down with horror fans. From George Romero’s 1968 classic Night of the Living Dead and AMC’s The Walking Dead to the BBC’s lesser known but excellent mini-series Dead Set and Colson Whitehead’s recent apocalyptic novel Zone One, you just can’t keep a good zombie down. Unless, of course, you put it down by destroying or removing the brain. In the meantime, here’s some pointers on creating an effective zombie comic. Take notes, folks. There is a test later.